In batteries, fuel cells or technical coatings, central chemical processes take place on the surface of electrodes which are in contact with liquids. During these processes, atoms move over the surface, but how this exactly happens has hardly been researched. Physicists at Kiel University want to gain a better understanding of these motions, and the role of the chemical components involved. To do so, they observe with highest microscopic resolution how sulphur atoms move on copper electrodes, which are immersed in different saline solutions. Microscopic video recordings showed that these movements are controlled by ions, attached to the surface of the electrode. These findings could help to control such motion processes precisely, for example to optimise coating processes in the microelectronics industry. The results of this study are published in the current issue in the renowned scientific journal "Angewandte Chemie". 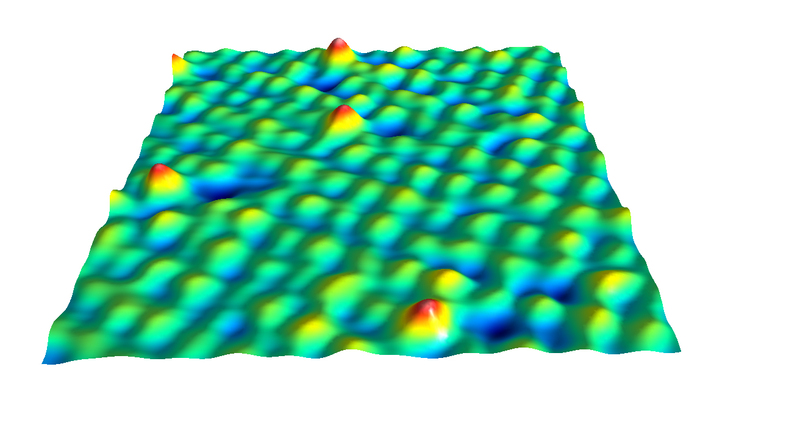 Computer simulations of the motion across the surface of a metal suggest that in the presence of a layer of bromide ions (magenta) sulphur atoms (yellow) change their positions by dipping into it. Doctoral researchers Björn Rahn (right) carried out the experiments with the scanning tunnelling microscope, Lukas Deuchler simulated the atomic processes on high-performance computers. Processes at interfaces are similar to a football game in a stadium: the team on the field must score the goals, but the support of the spectators probably also has an influence on the course of the game. "Ions or molecules that attach to a surface, can have a decisive influence on reactions occurring there, even if they are not directly involved," said Professor Olaf Magnussen, head of the Interface Physics Group at the Institute of Experimental and Applied Physics. In chemistry, these atoms are known as "spectator species". However, the exact influence of such atomic "spectators" on reactions at interfaces is, in most cases, only partly known. Further knowledge could help to control these processes better. In their experiment, the research group investigated copper electrodes in saline solutions, containing either chlorine or bromine ions. These ions accumulated as "spectators" on the copper surface. The researchers then added small quantities of sulphur atoms, and observed their thermal motion on the surface of the electrode. To do so, they used a special scanning tunnelling microscope, which can make single atoms visible - even in saline solutions. Since this works only at temperatures above freezing the atoms move relatively fast, the microscopic pictures thus have to be taken in a short time. In the scanning tunnelling microscope, a tiny metal tip scans the electrode, and thereby creates an image of its surface. Standard instruments can take one image per minute. Over several years, the Kiel working group further developed their microscope so that their instrument can generate up to 20 images per second. With this worldwide unique instrument, it is possible to capture in a video how atoms move on a surface. The resulting recordings surprised the research team: in both saline solutions, the speed of the sulphur atoms was strongly influenced by the voltage applied to the electrode. Even an increase of just 1/10 of a volt made them move ten times faster. However, higher voltage made the sulphur atoms move slower on the surface with chloride ions, but faster on the surface covered with bromide. "Chloride and bromide are chemically very similar - we had not expected this different behaviour," said Björn Rahn, who carried out these investigations as part of his doctoral thesis supervised by Magnussen. Clues to an explanation for these different observations were provided by computer simulations, produced by the working group of Professor Eckhard Pehlke from the Institute of Theoretical Physics and Astrophysics. "Sulphur atoms behaves so differently on surfaces with chloride and bromide ions, because the two ions trigger different motion mechanisms," said Pehlke, to explain his team’s calculations. While sulphur atoms in the presence of chloride ions move only on the surface the calculations for the surface with bromide ions suggests that sulphur atoms briefly dip into the metal surface while changing their positions. The computer simulations confirm that the bromide and chloride ions on the surface are more than just passive spectators, and instead directly influence the chemical processes. These fundamental research findings do not just help to gain a better understanding of elementary processes at interfaces. "Our results are also a first step towards better controlling such electrochemical processes," said Magnussen, looking ahead. The research was financially supported by the German Research Foundation (DFG). 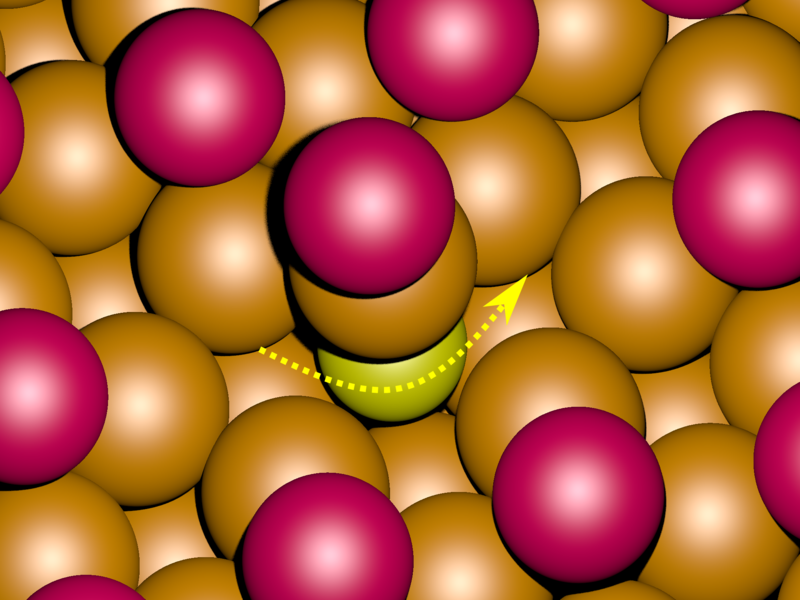 Caption: Computer simulations of the motion across the surface of a metal (orange) suggest that in the presence of a layer of bromide ions (magenta) sulphur atoms (yellow) change their positions by briefly dipping into the metal (see arrow). Caption: The recording of the scanning tunnelling microscope shows sulphur atoms (red) on a copper electrode, surrounded by bromine ions (green). 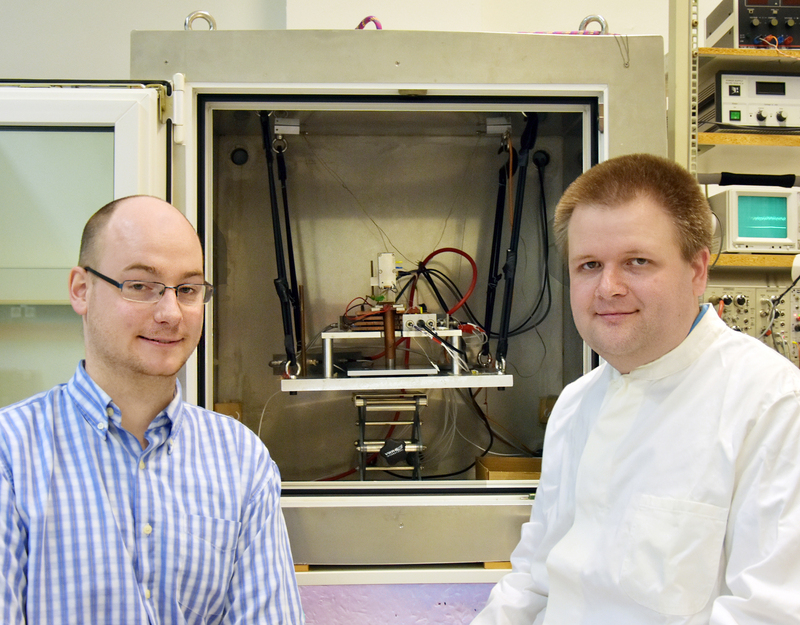 Caption: Doctoral researcher Björn Rahn (right) from the Interface Physics Group carried out the experiments with the scanning tunnelling microscope. Lukas Deuchler, who is currently a doctoral researcher in theoretical physics, simulated the atomic processes on high-performance computers.